Kyle and Susie with their catch! 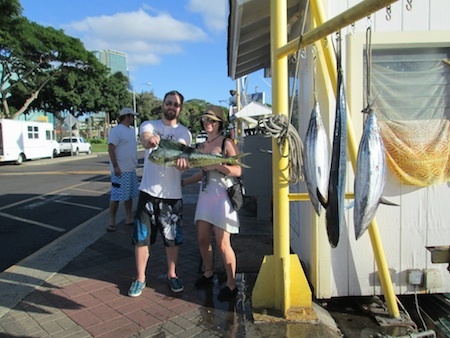 Mahalo to Kyle and Susie for choosing Maggie Joe Sport Fishing! The pair joined Captain Matt aboard the Ruckus on a sport fishing charter. 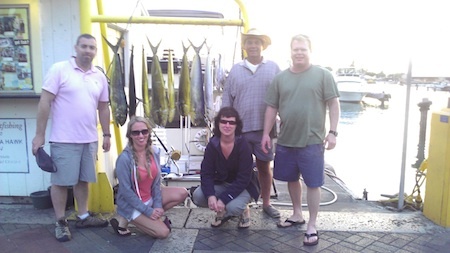 They hauled in a pair of Mahi Mahi and a couple Tuna’s while deep sea fishing off Oahu, Hawaii. Aloha! 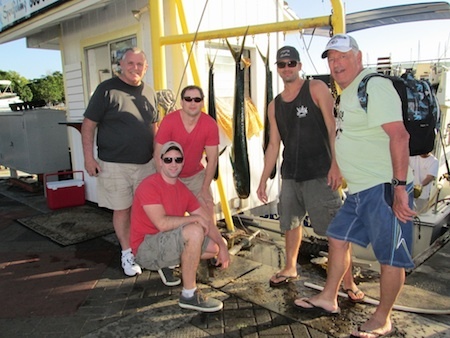 Chris, Nick, Don, Jason, Todd and Beto with their catch! 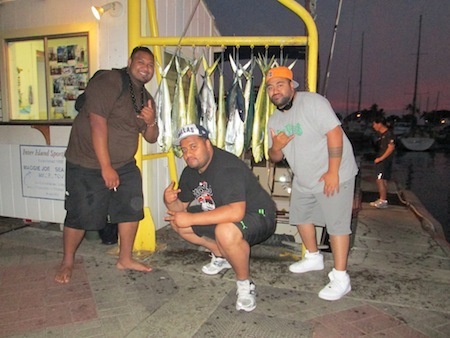 Mahalo to Chris, Nick, Don, Jason, Todd and Beto for choosing Maggie Joe Sport Fishing! 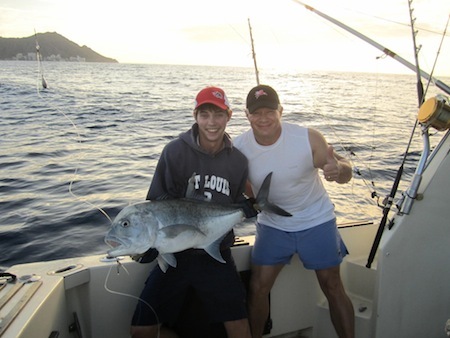 The guys joined Captain Darryl on a shared full day fishing charter aboard the Sea Hawk. 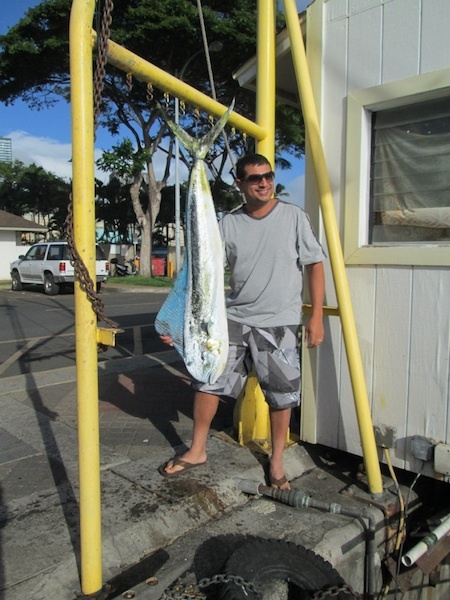 While deep sea fishing outside of Oahu, Hawaii they brought in 3 tasty Mahi Mahi. Aloha! We would not hesitate recommending you, Daryl, the ‘Maggie Joe’ to any of our family and friends for a truly great deep sea fishing experience. We hope to be back next year and call you again. Please thank Daryl again for pampering the girls and looking after all of us. A big thanks to you too for all your hard work! You two are the best!!! Kindest regards and best wishes for a very Merry Christmas and all the best for a healthy and prosperous 2013!!! 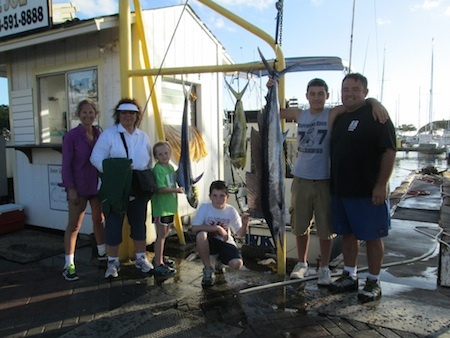 Rene, Pat, Chris, Michael and Nina with their catch! 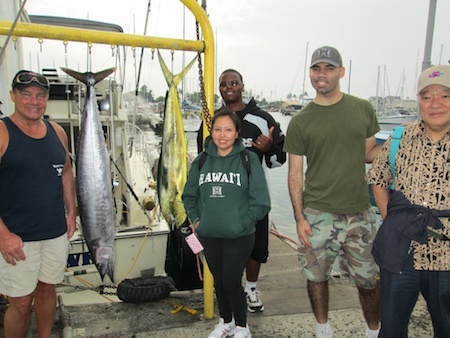 Big Mahalo to Rene, Pat, Chris, Michael and Nina for choosing Maggie Joe Sport Fishing! Captain Darryl did not disappoint as it was a solid day of sport fishing. Good fish and good fun! 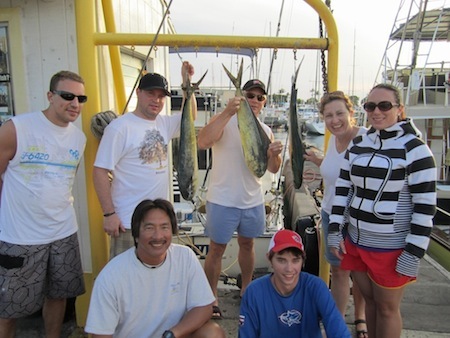 8 Mahi Mahi were reeled in while they were deep sea fishing outside of Waikiki, Oahu aboard the Sea Hawk! Hana Hou!